If you have an existing Google account, you can use those credentials to sign into Method. The following steps will show you how. First, go to Method's sign-in page. Click Sign in with Google, which will take you to one of several screens:Google will ask your permission to allow Method access to your Google account. If you are not signed into a Google account on this browser, you’ll be prompted to do so as normal with your Gmail address and password. If you sign into (or are already signed into) a Google account on this browser with multiple email addresses associated with it, you will be asked to choose which email address you’d like to link to your Method account. If you sign into (or are already signed into) a Google account on this browser with only one email associated with it, you’ll be automatically moved to the next step. Google will ask your permission to allow Method access to your Google account. Click Accept. Provide your Method ID, then click Link & Sign In. If you have more than one Method account, you’ll be prompted to choose which one you want to sign into. Choose, and you’ll be signed into your Dashboard. If you have only one Method account, you will be sent directly to your Dashboard. In a little while, you'll receive an email telling you a new Google Calendar has been set up for you, which will display all activities you create in your Method account! If you disconnect your Google Account and choose to reconnect, Method will automatically search for a calendar associated with that ID. And that’s it! From this point forward you can simply click “Sign in with Google” from our sign-in page, and you’ll be automatically signed into Method with your Google credentials. If you're already signed into a Google account while following the steps above, Method will attempt to automatically associate itself with the currently active account. If you prefer to associate a different account, you candisconnectthis account and then follow the steps above to reconnect the account of your choice. Here's how to disconnect. Scroll over the top right hover menu and click My Profile > Connected Accounts. Next to Google, click Disconnect. And that's it! You're disconnected! You can now follow the steps above to reconnect the account of your choice. Why should I use my Google Apps to sign into Method? In a word: convenience! If you are a Google Apps user, you likely have your Gmail, Google Docs or Google Calendar open all the time. Being already signed into Google Apps means you can be automatically signed into Method. That means one less user name and password to remember and type in every time! 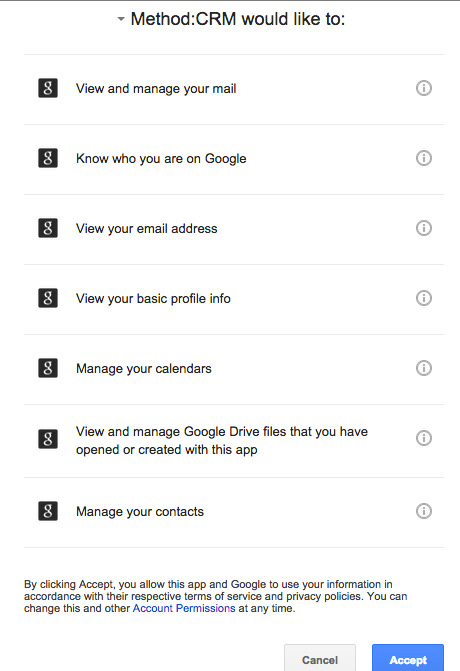 Also, if you have multiple Method accounts, you can use the same Google Apps login to access all of them! Does it work with regular Gmail, or only business Google Apps accounts? Unfortunately, we only integrate with a paid Google Apps business account. Google does not provide free Gmail accounts with the same features as paid Google Apps account. When you sign in with your Google Apps account, you are entering your Google password on Google's servers. Google never shares your Google password with Method, and Method never shares your Method password with Google. The authorization process delivers an Oauth token that Method can use to integrate with your Gmail, Google Calendar, Contacts and Google Docs.